2. Arrange paper liners on baking tray. 3. Hand whisk egg yolk and sugar till pale in colour. 4. Add in corn oil and milk, mix well. 5. Sift in cake flour, stir to combine. 6. Beat egg White until foamy, gradually add sugar, and continue beat till soft peak form. 7. Take 1/3 of egg White and use a hand whisk to mix into egg yolk batter. 8. Fold in the balance egg White with a spatula till well combined. 9. Scoop batter into pre-arranged paper liners to about 3/4 full. 10. Bake for 20-25 mins at middle rack. 12. Add in strawberry puree, mix well. 13. 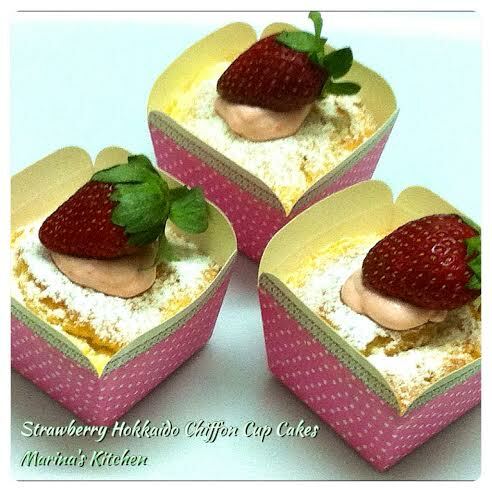 Pipe strawberry cream into cupcake and dust with icing sugar. Refrigerate before consume.